With the inspiration of Sadguruvarya Shastri shree Madhavpriyadasji Swami, in the holy presence of Purani Swami Shree Bhaktiprakashdasji Swami and under the guidance of Purani Shree Balkrishnadasji Swami, celebration of Jalzilani Mahotsav was carried out in great devotional fervor in the presence of thousands of devotees & dignitaries from nearby villages and towns of Nagher region on the auspicious day of JalZilani Ekadashi, 20 Sep 2018 at Gurukul Droneshwar. 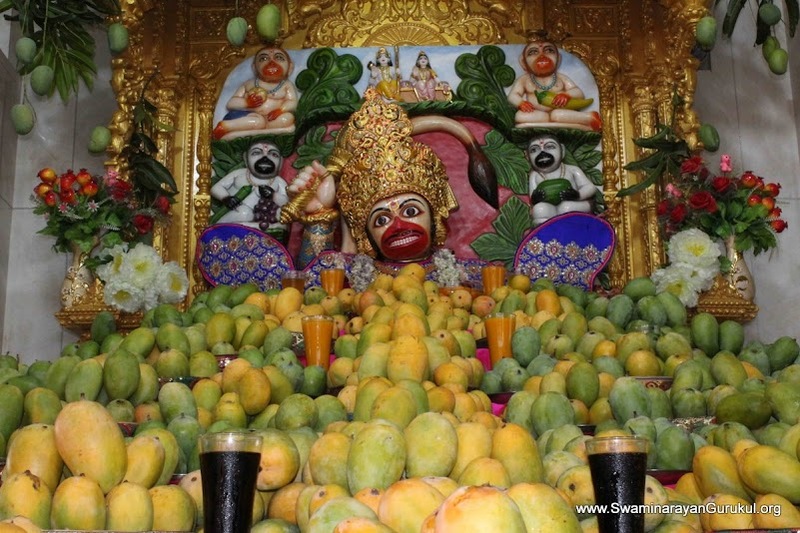 With the inspiration of Pujya Sadguruvarya Shastri Shree Madhavpriyadasji Swami & Pujya Shree Balkrishnadasji Swami, Kesar Mangoes offered to Shree Kashtabhanjan Dev, Maruti Dham, Gurukul Droneshwar, as AAMRAKUT UTSAV celebration. Prasad was distributed to poor and kids.